Which part of your home did you fall in love with when you saw it for the first time? When we first looked at this home I fell in love with the rustic reclaimed wood door casings. I walked in and I knew I had to have it! Of course I loved most everything else about the home too, but the reclaimed wood casings were the icing on the cake. I love the blended rustic and cottage styles of this home and I couldn’t wait to add my decor to it! 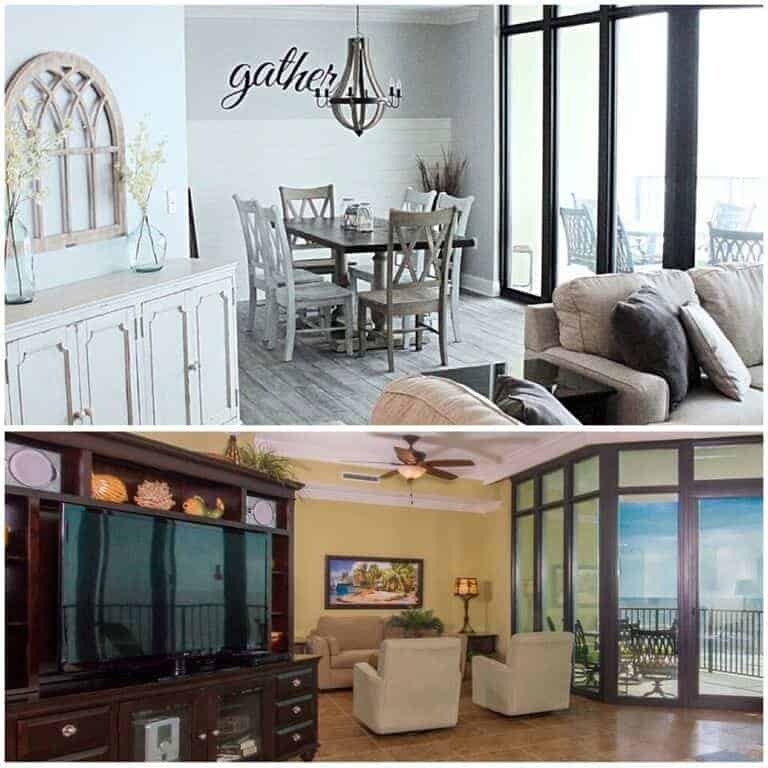 Come along and let me share with you my rustic beach cottage dining room with a few new decor touches. 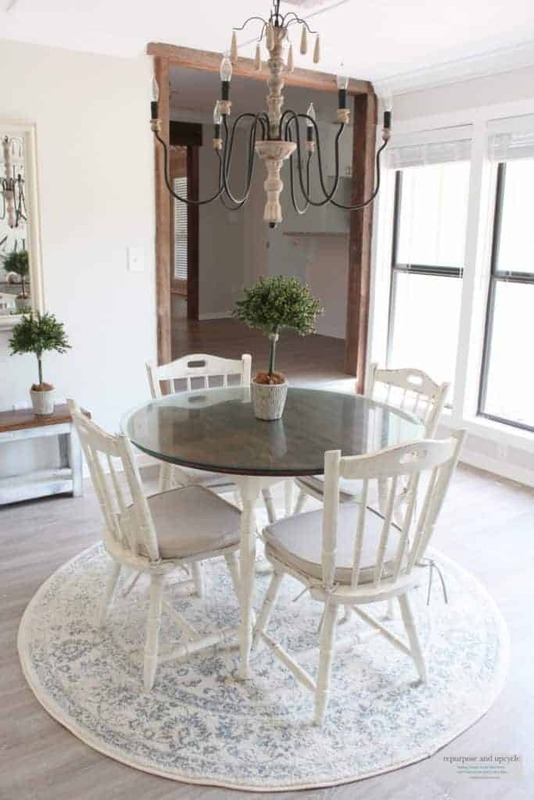 Did I tell you the story about our dining room dilemma? It’s not really a dilemma, just a change of heart. When I wrote about our decision to leave our 3100 square foot home and move to this older, smaller cottage, my heart desired a home with less wasted space. Our previous home had a large dining room (which was used maybe twice in the three years) and an eat in kitchen. We spent ALL our time eating on this vintage kitchenette in the eat in kitchen. So why did I need an extra dining room? I didn’t. I know some of you are thinking even though I don’t use it now, I might in the future. The truth is, I’m not a very formal person. I’m also not much of a cook, although I’m working on that (sort of, lol). You can probably guess that this home only has one eating space, and I am more than thrilled about it! The best part about having less space means less to clean. With two littles running around, you can imagine I’ve got a lot of cleaning to do. I’ve always wanted a huge clock that really made a statement in the room. I love that this clock is made from reclaimed wood and hand painted with our name and wedding year on it. I love to create spaces, but I really believe in personalizing spaces with items that mean something. Pretty decor is nice, but it means so much more when there is a story behind it or a link to your family. 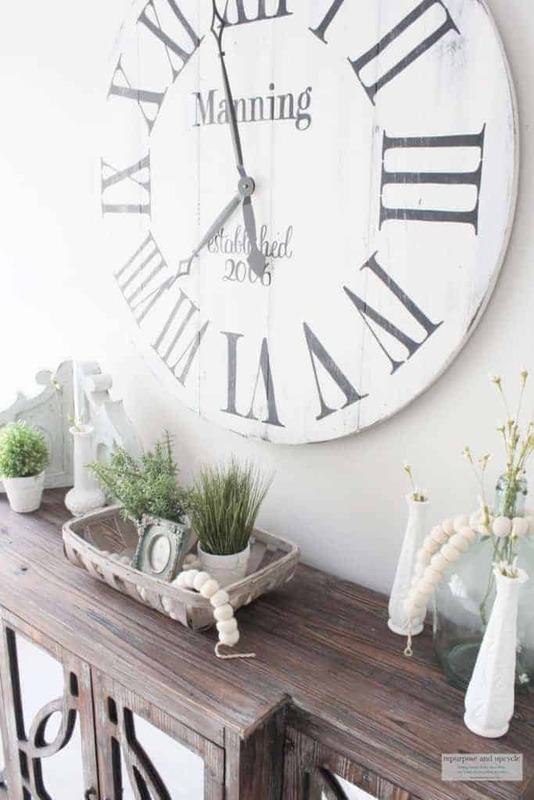 This clock was made by Aimee Weaver Designs. This post contains affiliate links. This means that if you purchase from one of these links I will make a small commission, but be assured you will pay no more for the product. 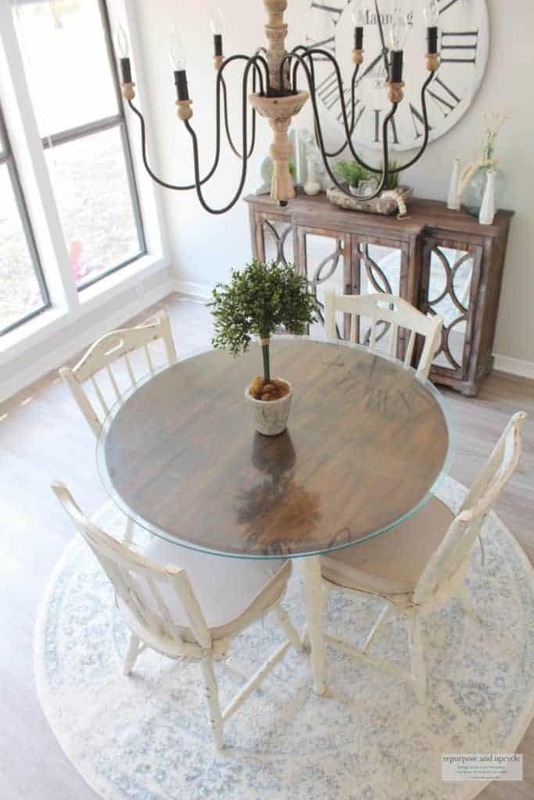 Another decor item I had to have when I was creating this rustic beach cottage dining room was arug. I love how a rug adds warmth to a space, even if my kids might ruin it with food in a month. 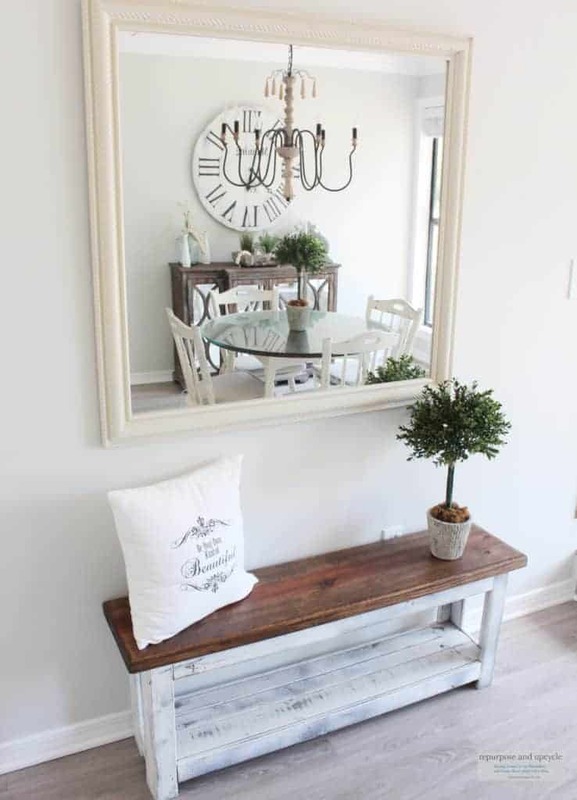 Let me share another corner of the dining room with a few more rustic cottage touches. I don’t have a corner table that works with this space, so why not create my own by repurposing a few wooden crates? I think it works for now. Don’t ever think you can’t shop your house to create a solution for a space. Sometimes it just takes a little creativity! I still love my DIY Topiary Trees that you see as the centerpiece. Adding a little green always warms up a space, don’t you think? 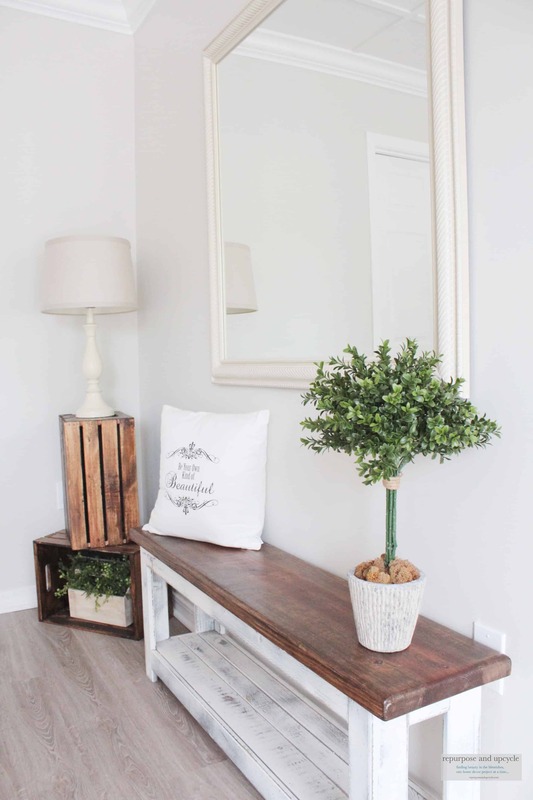 There are so many easy ways you can use greenery in your home.I purchased that bench from a local store about 4 years ago, and I still love it. The Pillow was made by a friend of mine I met on Instagram. Those rustic reclaimed wood beams……. I love how this room has really come together. One room down, now the rest of the house to go! Stay tuned because my next project involves the mudroom with a fun shoe storage idea. As always, thanks for following along this crazy budget friendly DIY journey. Your dining room is beautiful! I just love that chandelier!!! It’s an adorable room. 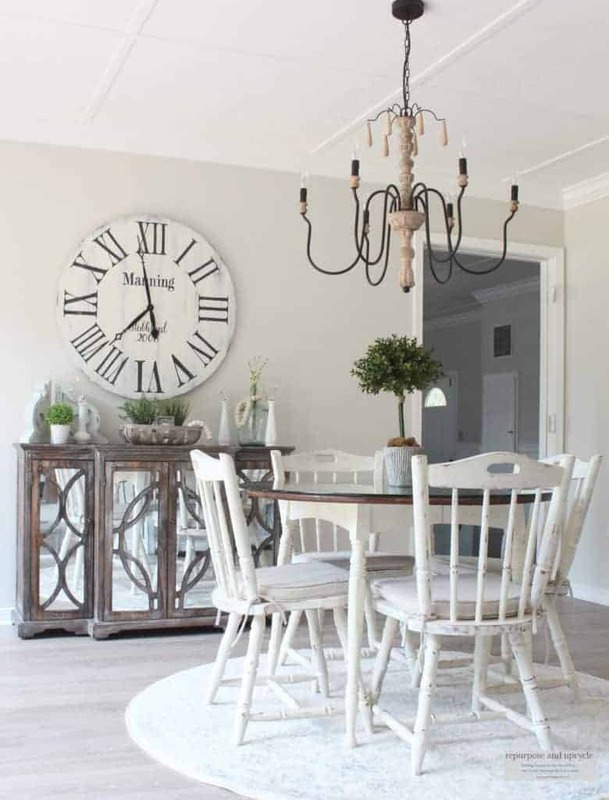 I love the clock and the sideboard. wow good for you! I would love to see how it turns out. Thanks for stopping by Margy. I do not have a formal dining room and have never missed it! I debated about creating one in the small room in our entry, but opted to just have a sitting room. Either way, it’s rarely used. Love your simplistic and welcoming beach cottage décor! Thanks for sharing with SYC. Oh my I had a table just like that one. I raised my kids using that table and recently I had enviosioned doing exactly to it what you did! It looks great! Now I am crying I didnt do it and got rid of my table when I moved. I should of hung on to that table full of memories to do this to! I know the post wasn’t so much about the table but for me thats what grabbed me. So glad I hoped over from the bloggers pit stop today! awww I’m so sorry you got rid of the table! I, too, have given furniture away that I regret. Thank you for stopping by Susan. I love your charming dining room. Love the neutral … makes the “nature” shine! Love the rug. 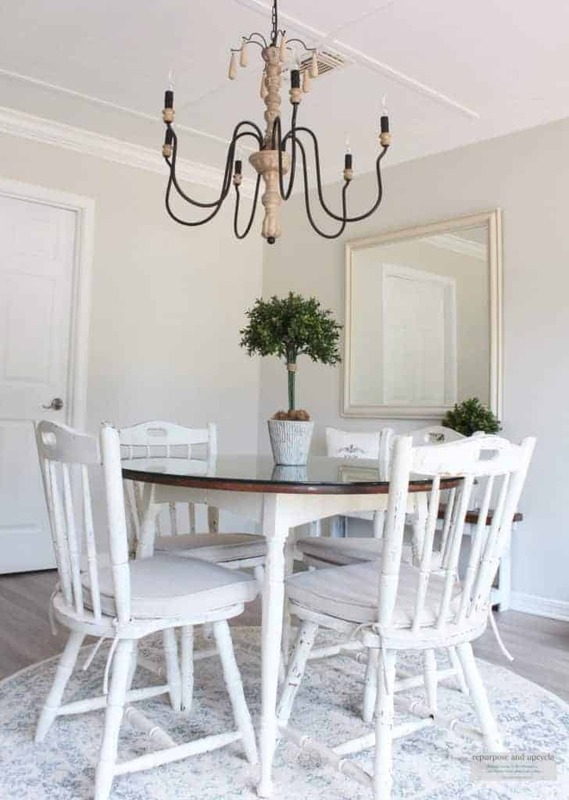 Lindsey, I Love your decorating design taste and the beautiful dining room. WOW So many wonderful touches you have added in this room. I love the chandelier and the bench.. well I love it all. Thanks for linking up with #TuneInThursday I look forward to seeing what you share this week. Thank you Debbie that means a lot! Wow! It looks so beautiful. Your posts are quite helpful for us. I also love to decorate my home quite often. Recently I used an amazing decor item in my home renovation. I place Himalayan salt lamps in my living and dining room. these lamps have enhanced the whole decor. Your dining room is so gorgeous. You have decorated it so beautifully. Hi! Just wanted to let you know I love this beautiful space, and I am featuring it tomorrow morning in a blog post for the Summer Time Fun Link Party Features. Thank you for joining in the fun of the link party!